Since the Big Funny art show has come to an end, I'm sharing my comic strip with you here. Big Funny, the publication, is still available, click HERE for info. Big Funny illustrated logo by Zander Cannon. Comments appreciated, as is your listing a link to this blog on yours! 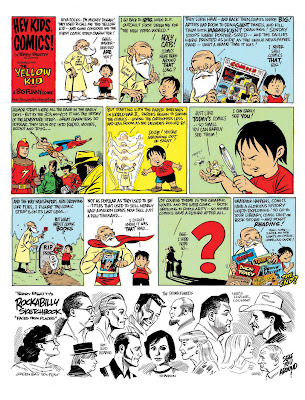 Click on the comic for a larger view. Kansas City vs. Twin Cities! Rockabilly Rumble! Who Knows What Evil Lurks...?